Means before jttw, only Indians pray to monkey king. Not the Chinese? Partly for protection, partly so he would not play pranks on them. He was a mischief maker. If you believe that Hanuman and the Monkey King are one and the same, sure. The one who was prayed to in China, the one I'm referring to above, was quite different from Hanuman. Back then, he was known only as 'The White Monkey'. 2) In a long ago post, I read an article from Asia One news that there was a Malaysian Chinese businessman who tranced Zhangfei, one if the 3 famed Peach Blossom Garden trio. He conduct his business in a small scale sintua without the usual fanfare. 3) In the recent msg you guys talked abt Master Szeto, a HK based priest who acted in those real life documentaries. I came across this Malaysian Chinese chap, through watching this Youtube channel 灵异侦查 II. He is Jin Long Wang (Golden Dragon), who was something like Szeto Fazheng but more. 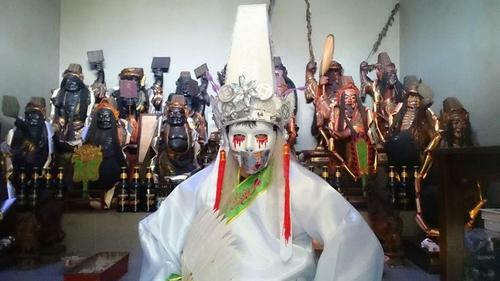 Along the stories/videos, i saw a video abt this young Malaysian Chines boy called Jiaming or something, who claimed that he was infused with spiritual dragons from Guanyin. A Lianhe Wanbao article reported that he came to SG to help with some problems. In the video he claimed to be able to see things the naked eyes cannot see. He claimed that Jin Long Wang was accompanied by powerful dragons fluttering behind his back when he saw him. So how true are all these? Nachtcy, in your opinion? Before Journey to the West was written, people in China were already praying to an entity known as 'The White Monkey'. He was an infamous mischief maker. In terms of prowess, I think Hanuman match closer to the monkey king that was depicted in the novel. Hanuman was also renowned for demon slaying. 1. When a certain belief spans different cultures that are unlikely to have interacted, you really have to wonder. 2. Not inconceivable. I have heard of Zhang Fei being channelled, and even have several photo of purported Zhang Fei mediums - they are all from Indo-China and Indonesia. 3. Also not inconceivable. People who possess the second sight have the potential to see all kinds of supernatural beings, not merely ghosts. And spiritual masters/gurus often have otherworldly guardians watching over them. I'll give you that, haha. The White Monkey was more a prankster and a troll than anything else, but then again, the Monkey King was both those things, too. nachty do you keep any pets before or current ? if so what pets ? When you ask a question here, make it relevant. Why is there , Indian version of hanuman and Thai version hanuman . Some say sun wu Kong is the æŠ•èƒŽè½‰ä¸– of hanuman ? Regarding earlier discussion on reincarnation. So which means 2 parties indebted to each other, means they last life born as asia chinese buddhist, next life also same and they will meet? How come cannot reincarnate as animals.. surely as humans again...? Lol, who says they don't? Two souls will continue to meet throughout various existences if they remain karmically indebted to each other. They need not necessarily remain as two human beings, nor need they share the same race or religion. If the debt is settled, then it's bye bye.